Animal Friends reveals shameful "organic" farming. "Organic" farming is just a nicer term for equal exploitation of animals as well as in the conventional breeding. In the same way as there is no thing like "humane slaughter," there is no "humane" breeding of animals. The more and more popular animal products on store shelves labeled as "ecological," Free Range, organic, etc., hide a great deal of animal suffering behind the beautiful packaging and attractive brands. Manufactures benefit by charging much more for an "ecological product," and consumers are willing to pay the price in order to overcome feelings of guilt, without having to give up on meat, milk and eggs. Farmers invest more and more money in marketing to show their "ecological" farming as humane and caring towards the animals. By doing so, they create a fairytale image of animals that freely roam the meadows and pastures in a clean and healthy environment, all in order to improve sales. This is their way of blurring out the inconvenient fact that, in the end, all animals are slaughtered. 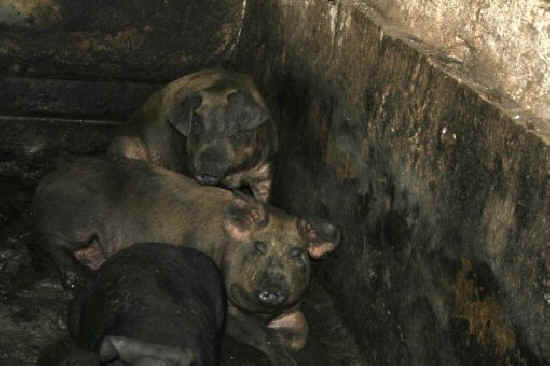 Animal Friends has received photos and footage from the pig farm of Eko-Mavrovic d.o.o. where it is obvious that the pigs live in a filthy building in their own feces and urine, without access to food and water and without dry areas with litter to rest on. They drink the water in which they also defecate, lie in the empty troughs for food and the wet dirty floor. In the area where they are settled it is impossible to even breath because of the stench. From this area, the pigs go to the slaughterhouse only a few meters away on the same farm. Besides violating his own principles by which he claims that money and profit are not his only motivation and life guide, Mavrovic also violates legal conditions of "eco" farming. Eco breeding of pigs is assigned by the Regulation of organic animal farming (Official Gazette 12/02, 10/07), and it is based on keeping the animals in a more natural environment. This way of farming is designed as an alternative to the conventional breeding to increase the welfare of animals. 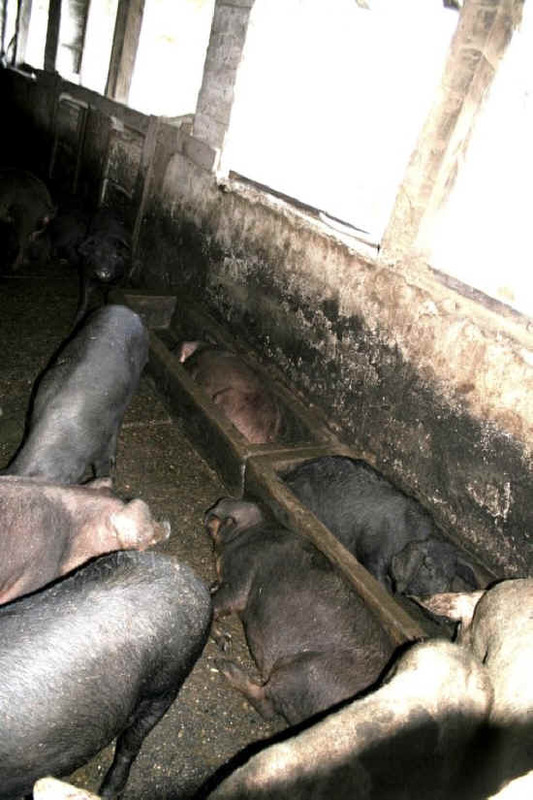 The Regulation prescribes a minimum of requirements for organic breeding, including: several functional areas in the facilities to keep the pigs clean; clean, dry and sufficiently large surfaces for the animals to rest; litter of straw or other suitable natural materials; all time availability of food and fresh water; ventilation and heating in the facility; preventive health care based on proper nutrition and housing, and general hygiene by disinfecting facilities, equipment, etc. Pigs and other animals that are bred for human food, develop complex social relationships and emotional connections. Animals communicate with each other, and have a tendency to react stressfully or get sick when in poor housing conditions and bad treatment. 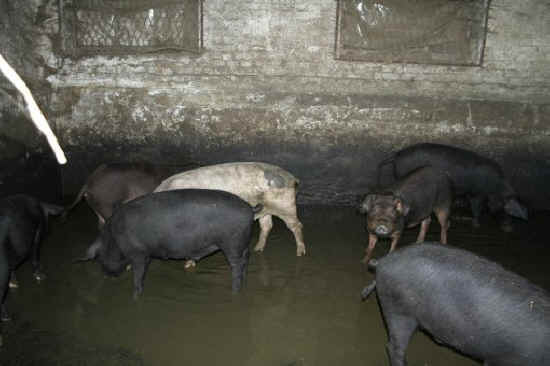 Although they are very clean by nature, pigs are forced to live in dirt and their own feces even in the "eco" farming. "Organic" farming is just a nicer term for equal exploitation of animals as well as in the conventional breeding. In the same way as there is no thing like "humane slaughter," there is no "humane" breeding of animals. Pigs, chickens and cows bred and killed for meat, milk and eggs are still being taken from their mothers. They still live unnatural lives that end in horrible violent deaths at a slaughterhouse. If dogs or cats were forced to tolerate this kind of conditions in order to satisfy the human appetite, the public would never allow for the products to be marked and promoted as "organic" and "humane." Animal Friends appeals to the citizens to choose an ethical, healthy and environmentally-friendly diet instead of purchasing the conventional and "organic" meat, milk and eggs.